Tonight I pulled out my old journals. Some are hard back. Some are leather. Some have spiral bindings, others do not. Some have crazy designs, while others are just solid colors. The journals I have only date back to about 2002/2003. The opening pages in the oldest journal aren’t dated. These journals are where I collect most of my random thoughts. And sometimes the pages look very random. It’s where I record experiences that were meaningful and where I reflect on the meaning of those experiences. Sometimes those experiences and thoughts find their way into a youth ministry talk or a sermon. Sometimes they get further developed here on this blog. I began to flip through the oldest journal. I saw a lot about college and classes. I even remembered an old classmate I had forgotten about. And, thanks to the gift of Facebook, I friended her. I saw stories from youth group (I had just started!) And there were lots of questions. Many of them raised during youth group or Bible studies. Questions that, for me, were the first time I ever thought about them – much less struggled with them. It was interesting and captivating to go through those pages and read my thoughts and see how I processed through those questions and experiences. And how pages later, I was still struggling with them. I read about our youth group walking the Slave Trail in downtown Richmond and about a boy named Seth, who has autism, asking me to tell him a story about Jesus. There are prayer lists sprinkled through out and there are notes about films I had just seen. (Ozzie from Over the Hedge: “We die, so we live.”) There were chronicles of adventures with friends, most notably those in Target with Kristin. There are outlines for youth group programs and retreats. I’m sure there’s some deep, theological stuff going on there. 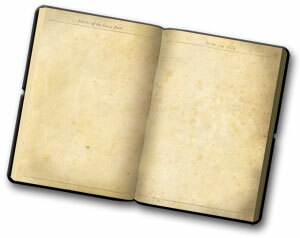 Towards the front of this ancient journal were memories. I didn’t value the spiritual practice of journaling when Dad was sick as I do now. This journal starts off remembering my father, his sickness, my thoughts and emotions around all that. I had forgotten these pages existed. By my best estimate, it was most likely written a year after Dad passed away. My father once told me that I had an incredible gift from God. The gift of listening and hearing stories. Stories have always been a huge part of my life. And stories – telling stories, hearing stories, connecting stories, finding God in our stories – has shaped my youth ministry over the last ten years. A lot of this was molded through classes with Dr. Dori Baker in seminary. As I continued to flip through the journal, it suddenly stopped. There were a number of empty pages in the back. Blank. White. Untouched. Stories untold. But then, it made me think, “What stories are these pages telling?” Are they stories filled with such joy that words could not express them? Were they stories filled with stress and anxiety that no time was found to tell them? Or maybe they were stories that were so painful that retelling it would only cause more pain. I guess we’ll never really know. But, I’m reminded as I flip through those empty pages, that whatever stories those pages were telling, God is in the empty pages. God lives there, dwells there, and loves there just as God does anywhere else. God is still in control in those empty pages days and uses what happens there to shape and mold us into who we are in the non-empty pages. So, may God bless the empty pages days.